Vesterheim lends objects to institutions around the country. These have included the Mingei International Museum, San Diego, California; Haydon Art Center, Lincoln, Nebraska; Ellis Island, New York; Mint Museum, Charlotte, North Carolina; and the Apron Museum in Iuka, Mississippi. The locations of all the Vesterheim’s exhibits and objects that currently on loan are listed below. This five-year loan to their core exhibition includes a Luther College pennant, a political button, and a bygdelag badge. This exhibition, which explores the role of beer and aquavit as symbols of Scandinavian heritage, includes drinking vessels from Vesterheim’s collections. 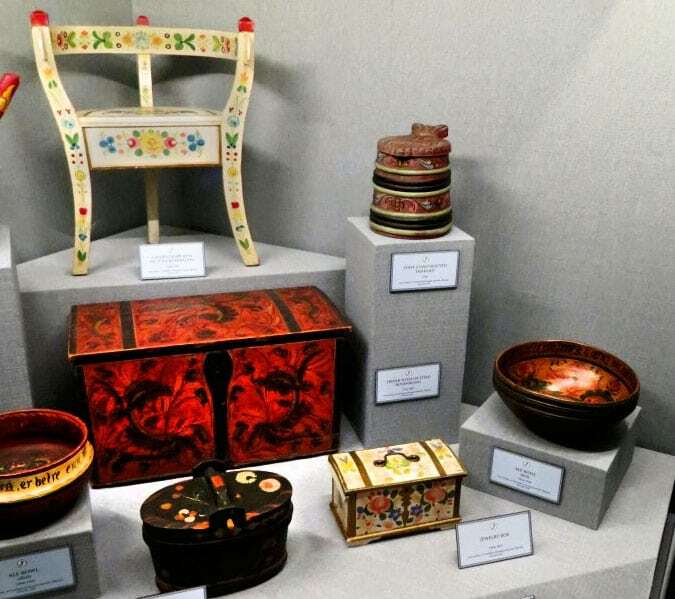 The exhibition’s venues includes The Museum of Danish America, Elk Horn, Iowa, Nordic Heritage Museum, Seattle, Washington; Swedish American Museum, Chicago, Illinois; Vesterheim Norwegian-American Museum, Decorah, Iowa; American Swedish Historical Museum, Philadelphia, Pennsylvania; American Swedish Institute, Minneapolis, Minnesota; and Elverhoj Museum, Solvang, California. Gundersen Clinic features a colorful display of clay and paper flowers made by Nordic Fest participants and inspired by Flora Metamorphicae, an installation of 4,000 ceramic flowers that were on view at Vesterheim Museum in 2014.